I just read a really interesting Economist article which, at first, I thought was very counter-intuitive. 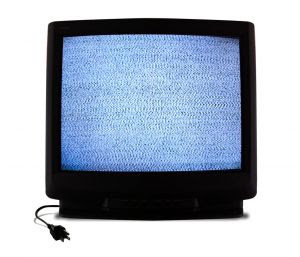 In the early days of television, there was very little in the way of network selection for the average TV-viewer. There were only a handful of stations and, regardless of how bad the content on a given station was, those stations would stay in business because they were the only stations around. Heck, even if the station’s programming was completely awful, there would still be plenty of people watching it simply because it was one of the only things that was on. Flash forward a few decades. We now not only have many television stations, not to mention cable, satellite, and internet video. We have enough DVDs to last a lifetime. The web has made it so that anyone with a camera and an internet connection can broadcast to YouTube. Given all this, what would you expect to happen to what people watch? If you’re anything like me, you would’ve concluded that the power of the internet to connect people with what they want and the abundance of new video content would have encouraged people to “spread out.” Why would you stick to a few “staple” networks, when you can now watch the SyFy channel for science fiction, CNN for the news, and YouTube if you want to keep LonelyGirl company? 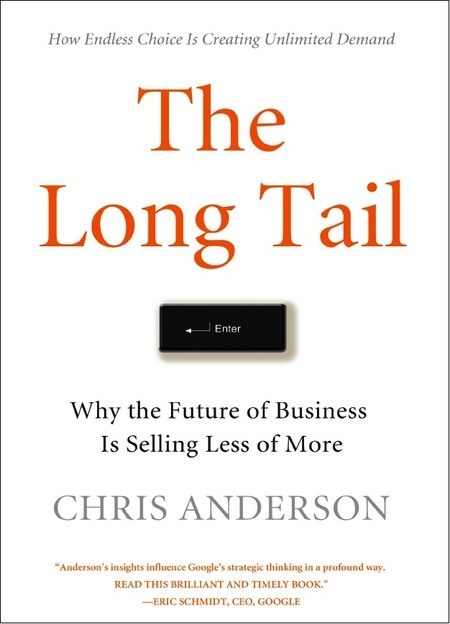 Well, writer Chris Anderson seemed to agree and he popularized this idea in a book (and “theory”) he called The Long Tail (book cover to the right). In it he describes exactly what I just laid out, that because technology makes it easier for people to find the things which the majority of consumers aren’t interested in, the future of business would be less about selling a few popular items that “sort of” appeal to the “average person” and much more about selling a lot of the “the long tail” (pictured graphically below) of things which really appealed to a few people apiece. Or, to use the TV analogy again, the idea behind the Long Tail is that it makes more sense to create a bunch of small TV stations which focus only on a few niches than it is to have one big station that tries to satisfy everyone at once. This is, after all, one of the big ideas behind eCommerce sites like eBay. Wal-mart or Target can and will stock lamps which sells several millions of units, but because they can’t possibly stock every lamp, they won’t satisfy everyone. The Long Tail theory says that the real money to be made is in selling the millions of things which are only going to sell a few items apiece, but because those items are exactly what those people want, you can probably make a little extra profit off of each. After all, how many authors or singers have you absolutely loved, but knew they could never go “mainstream”? As appealing as that idea was (especially to the snobs out there, myself included, who just wanted to assure themselves that the real money wasn’t in going mainstream but in going for the nobody’s-ever-heard-of-them CD/book/electronic/movie), reality has not played out quite that way. A study of the Australian market by Nielsen, a research firm, found that the number of titles bought each year (measured by ISBNs) has risen dramatically, from about 275,000 in 2004 to almost 450,000 in 2007. Niche titles selling fewer than 1,000 copies each accounted for nearly all the growth in variety. Yet their market share fell. In Britain, sales of the ten bestselling books increased from 3.4m to 6m between 1998 and 2008. Ironically, it turns out the technology which makes the long tail more accessible is even better at turning hits into even bigger hits. After all, the internet helps spreads word-of-mouth for hits and long tail products alike. If anything, the fact that technology today makes it so easy to choose between different things is going to drive people to look for hits if only so they have something to talk about with one another. Unfortunately for content and product people, this makes business very tricky. It means you can take one of two routes to success: make a blockbuster hit or sell a lot of niche products which appeal a great deal to a few people each. The former is tough to do because its hard to know what will be a hit. The latter is tough to do because you’ll need to have a very lean cost structure to be able to profitably make a lot of products which are only selling a few units a piece. But, the worst part is that trying to split the difference between both is especially hard as the former requires a big budget for marketing and for getting the best writers/artists/coders and the latter falls apart because you need to make many different things. Invest in strong PR and marketing muscle. If people seek hits because they want to be able to talk about things with each other, then the job of the product/content company is not just to make the best product possible, but its also to get people to talk about it. This means the smart companies will invest heavily in either a strong internal public relations/marketing group or a partnership with someone particularly strong in that area. This will be especially critical for the largest product companies/studios as having a strong PR/marketing capability will be an asset they can leverage across all their products, both those that need to be hits and those going for the long tail. Find ways to cross-sell. The economics of a long tail business are grim, because they involve keeping and developing a wide range of products that are each only going to sell a few items. How do you do well with that type of strategy? The answer is that you do everything possible to turn flops and long tails into hits. One approach is to take a page out of Amazon.com’s playbook: recommendations. Amazon has found a way to encourage buyers to not just buy one thing, but to buy several by using a sophisticated computer algorithm to find products which people tend to buy together. This lets a company use one product to many others: free marketing, in a sense. Be a lean, mean product-making machine. The only way to survive hits turning into flops is to make sure the hits don’t cost too much to make. The only way to make the long tail profitable is to make sure you have a lean operation in place which quickly and cheaply cranks out high quality ideas. Take some of the large social gaming companies like Zynga, maker of the very popular Facebook game Farmville. Don’t tell me that Fishville, Petville, Yoville, and Cafe World are completely original ideas :-). This is not to bash on Zynga, as I think the idea is brilliant and the quality of the games lies in the execution not necessarily in the originality of the concept, but in a world of hits and long tails, the best strategy is to find some core engine which you can re-hash and improve upon again and again. And few can question Zynga’s winning formula in that arena.